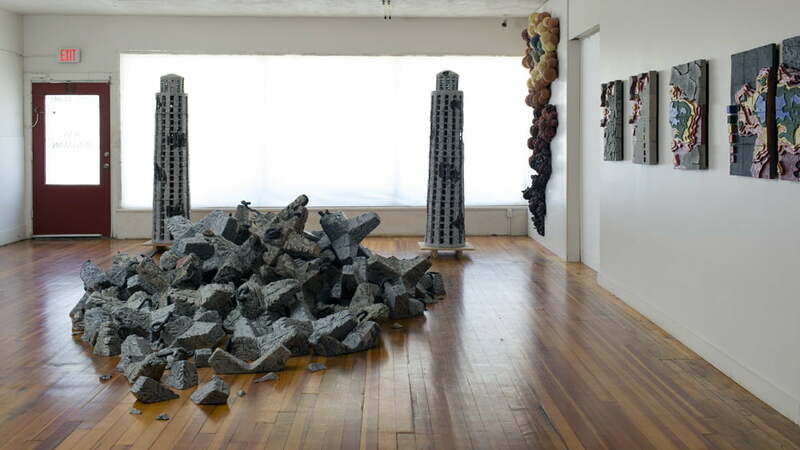 Sculptures depicting drought and climate change fill Jess Benjamin’s studio in the Benson neighborhood of Omaha. Photo courtesy Jess Benjamin ’01. At her studio in the trendy Benson neighborhood of north Omaha, Nebraska, artist Jess Benjamin creates large-scale ceramic sculptures that reflect her rural roots and convey a subtle message about water depletion and climate change. 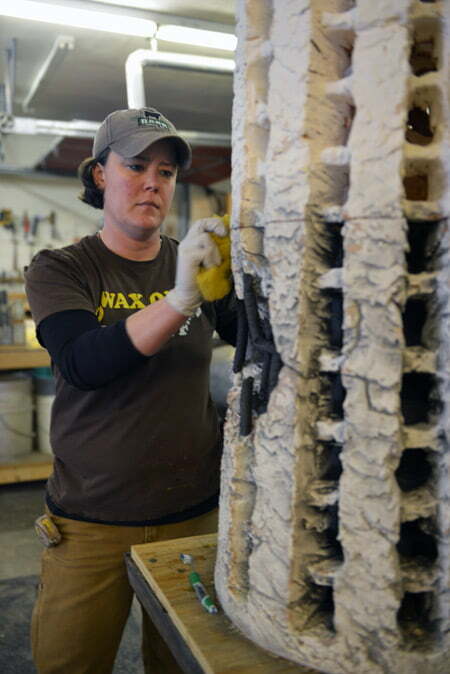 The 2001 Hastings College studio art graduate, daughter of a farmer and rancher in Cozad, Nebraska, forms globs of clay into H2O molecules and connects them to show patterns of drought. She relies on scientific data to create color-coded maps of the depleted Ogallala Aquifer, the massive groundwater reserve under the Great Plains. She sculpts clay into battered jackstones, the tetrahedrons that protect the surface of dams and remain hidden underwater until revealed by drought. Benjamin honed her artistic skills as the first and only female assistant for famed sculptor Jun Kaneko at his Omaha studio until 2006. She earned a full assistantship to complete her master of fine arts degree in ceramics at Bowling Green State University in Ohio, then headed back to Nebraska to open a 4,300-square-foot studio with a private gallery. From that space, she’s creating a career that both transcends and remains grounded in the ethos and concerns of Nebraska. Named one of Omaha’s “10 Showstopper Artists” by Alive magazine, Benjamin has exhibited at the Joslyn Art Museum, Great Plains Art Museum, Museum of Nebraska Art and numerous private galleries. She received an Individual Artist Fellowship Grant from the Nebraska Arts Council and her work has been featured in national publications such as Sculpture Magazine, Ceramics Monthly, Clay Times and NY Arts. Fittingly, she was commissioned to create pieces for the Water for Food Institute at the University of Nebraska-Lincoln and a water retention garden in the Benson Business District. When she’s not working in her studio, Benjamin is an adjunct assistant professor and director of the Lied Art Gallery at Creighton University. Jess Benjamin ’01 sculpts a Hoover Dam intake tower. Photo courtesy of Joslyn Art Museum, Omaha. Her father, Howard “Howdy” Benjamin, an inductee of the Dawson County Cattlemen’s Hall of Fame, taught her about the land and natural resources as they rode horses and did chores. Benjamin’s first environmental creations were inspired by the prickly musk thistles that grew rampant on her parents’ ranch. When she yearned to share a larger message, she sculpted the drought-exposed jackstones at Kingsley Dam, located at Lake McConaughy near Ogallala, Nebraska. Now a city dweller, Benjamin is expanding the scope of her creations beyond the Great Plains. Her latest work depicts the massive intake towers that control water flow at Hoover Dam. The eight-foot-tall, 600-pound sculptures are magnificent and stately but show signs of disintegration. Benjamin relies on sources like the U.S. Drought Monitor and scientific articles for the data she uses to create sculptures showing water usage, drought and climate change. She also listens to agricultural market reports on rural KRVN radio and talks to those on the front line, the farmers and ranchers like her father who experience the daily effects of environmental change. What she learns inspires sculptures that are powerful yet understated. She remains connected with her alma mater through programs like Open Space, the summer art immersion program for the state’s most talented high school art students. Last summer, she welcomed the group of 28 to her studio to construct cactus pots. This summer, she’ll teach ceramics to Open Space students at the Jackson Dinsdale Art Center, helping them learn to reflect on the world through art.